You know how perfume should be placed at your pulse points for maximum alluring effect? I feel the same way about jewelry. Most especially bracelets – hanging ever so elegantly at the curve of your wrist while you use your hands to tell a story. The tinkling of a set of thin gold bangles is your own personal stylish soundtrack. A classic look no matter what the occasion. Find a look that works for you – or find several – the bangle is a classic investment that will take you far. 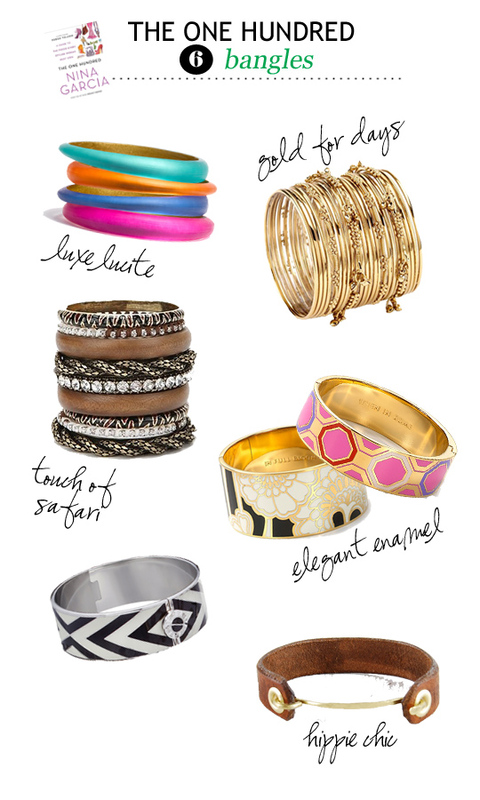 Want to learn more about bangles? Of course you do. Pick up a copy of Nina Garcia’s “The One Hundred” for yourself! We’re working our way through all 100 items to assemble the perfectly stylish, workable collection. *Not connected to or endorsed by Nina Garcia, but we love her. outsidevoice Copyright © 2019. All Rights Reserved.